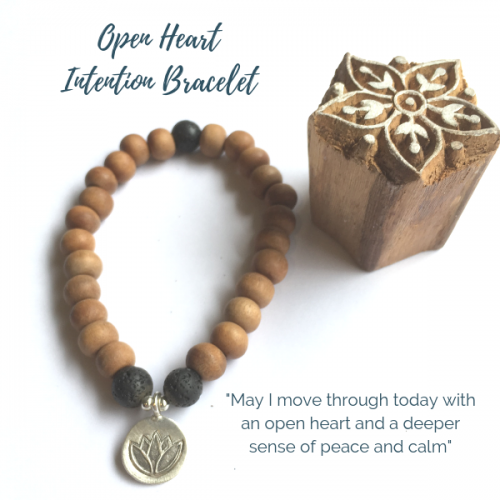 As you move through your day .. the Intention Bracelet acts as a gentle whisper to return to your breath and the present moment. 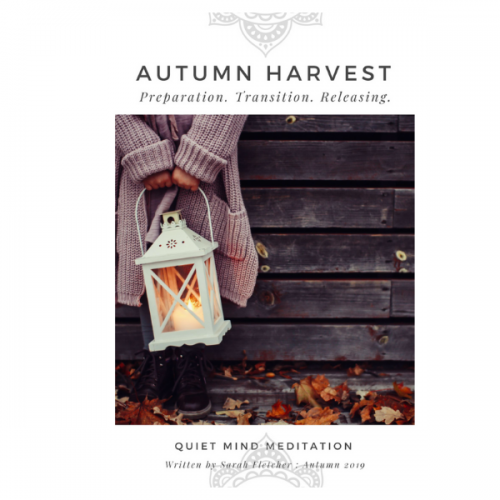 A visual reminder to keep our intention to meditate shining in our thoughts, also building mindfulness and awareness. 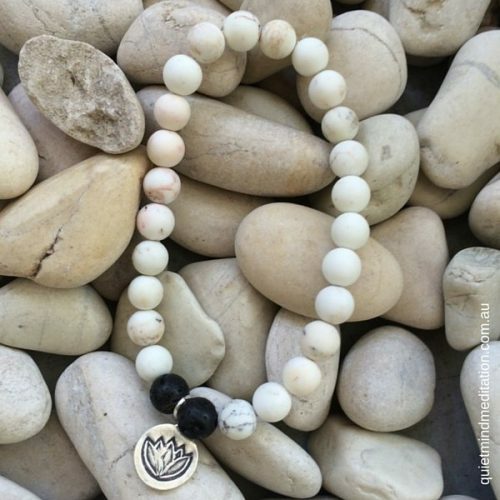 Howlite Bead: A stone of awareness, calmness, reducing anger, strengthening positive characteristics and the receipt of wisdom from the Higher Self and Divine. Black Lava Bead: A protective stone that repels negativity with a grounding quality that comes from being created deep within the earth. 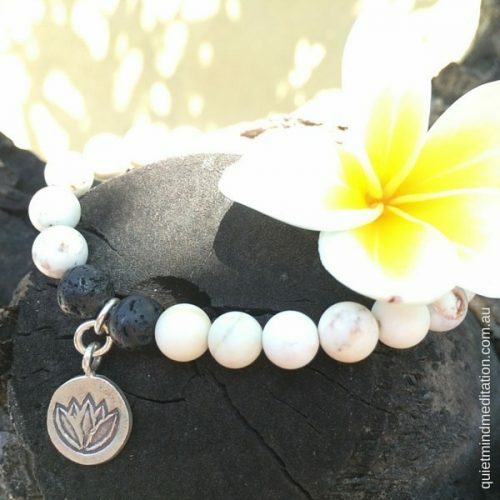 Thai Silver Lotus: Considered a sacred flower in many traditions; representing eternity, new beginnings, fortune and self-awareness. 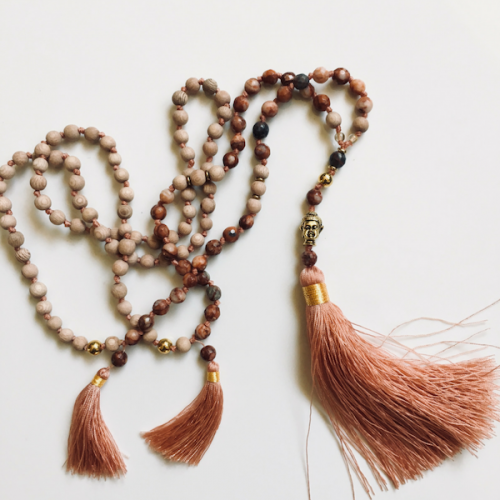 Designed for every day wear to accompany your daily intention. Specifications: Each bead is 8mm however each bead selected is unique and as all our products are made with natural materials we cannot guarantee bracelet sizes to be exact. Size information is approximate so if you have any concerns or specific requirements please contact us. 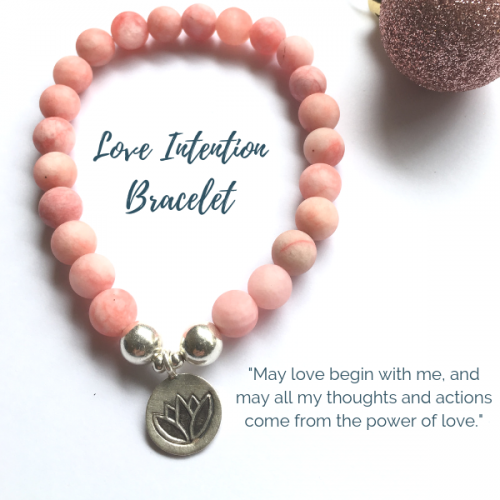 The Meditation Intention Bracelet is designed to provide a visual trigger to reminder you to stop, take a breath and turn your focus inward. 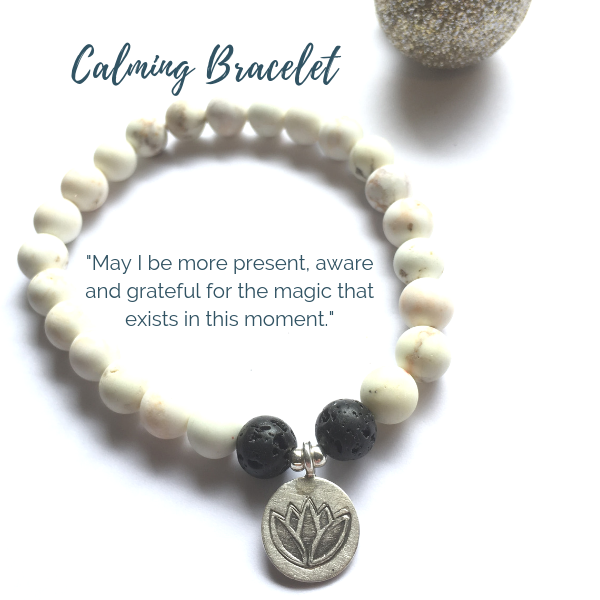 As you move through your day the bracelet is a gentle whisper to return to the breath and the present moment in this way keeping our intention to meditate shining in our thoughts .. building mindfulness and awareness. Inspiration: a chance meeting with a friendly Balinese beach trader introduced me to the striking black stone that is formed from local volcanic activity. Bali is home to a range of towering volcanic mountains that divides the island into northern and southern portions and to the largely Hindu-Balinese, the volcanoes are considered the homes of the gods and therefore sacred. The Black Lava Bead is the foundation stone for our Meditation Intention Bracelet (there are three styles in the range) and is an exquisitely formed product coming from the erupted magna that once cool produces a unique texture characterized by little voides left from the escaping gases. Howlite: a considered a calming stone, one that can be placed anywhere that balance and calm are needed, also helping quieten an overactive mind, release stress and prepare the mind to receive wisdom and insight. 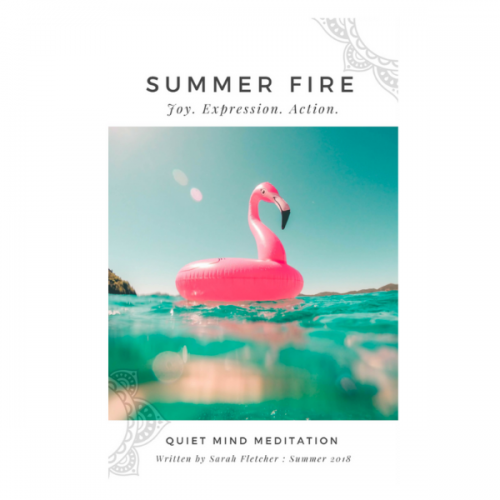 Thought to help clarify one’s mind and assist us to become aware of our deepest goals and ambitions, improve memory and help balance unprocessed emotions. 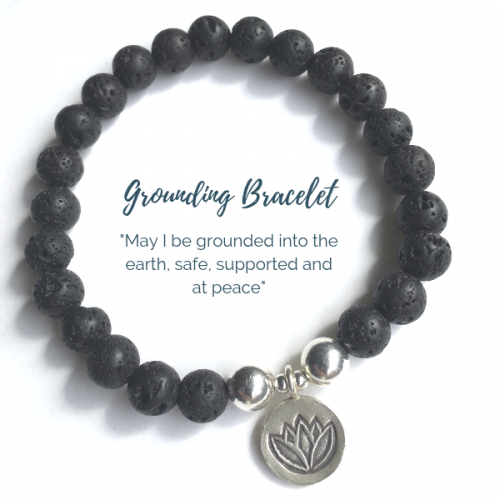 Black Lava Beads: believed to carry a powerful energy that brings strength, determination and passion; also considered a protective stone that repels negativity, with a grounding quality that comes from being created within the centre of the earth. 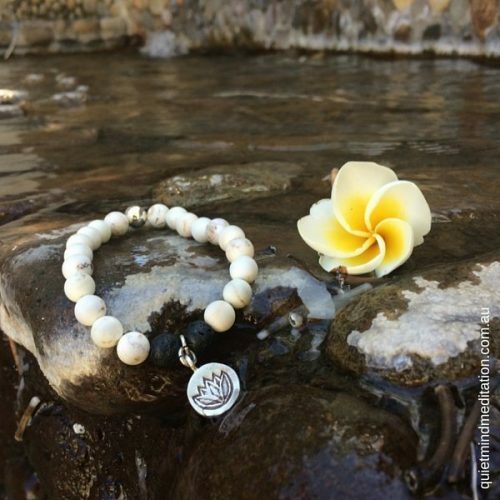 Silver Lotus Charm: the lotus flower grows in muddy water and closes at night, sinking under the water to wait for dawn when it rises above the surface to bloom with remarkable beauty. 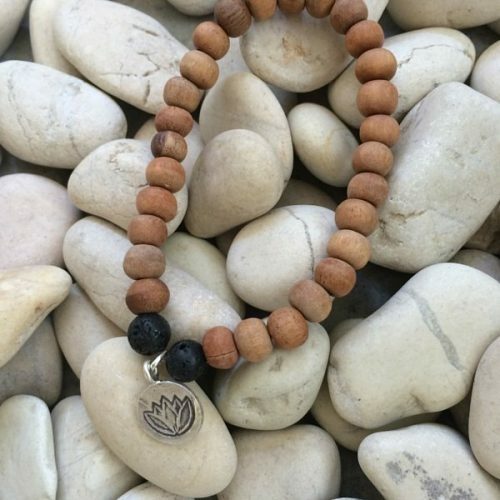 Untouched by the impurity of the muddy water the lotus symbolizes the purity of heart and mind and represents enlightenment, renewal, transformation and new beginnings.